The compact retail box of the Samsung Exhibit 4G is the home of a charger, a microUSB cable, a 4GB microSD card, and a pair of great sounding in-ear headphones. The usual T-Mobile/Samsung leaflets are on board as well. The Samsung Exhibit 4G measures 119 x 58 x 13 mm, and weighs 125 grams. These numbers put it in the group of the compact droids these days. The device feels compact and comfortable when held in hand. Its soft feel plastic prevents accidental drops. It is also not prone to fingertips. The purple colored Exhibit 4G unit, which we obtained looked rather feminine, yet there's also an all black version so it's not a girls only club. In fact the black color, coupled with the AMOLED screen of the device, makes it look like it means serious business. In this department, we believe Samsung deserves credit for the color scheme selection of the device, which will make it attractive for a wider range of potential users. You will find four buttons at the front of the device, arranged in a fashion similar to its Galaxy S bigger brother – the home screen button, which is the only hardware one from the bunch, and the touch sensitive Options, Back, and Search buttons. We found no issues with their usability. The screen of the device is one of its strongest features, which can put a lot of higher priced competitors to shame. The 3.5” AMOLED unit with 480 x 800 pixels resolution displays vivid colors, great contrast and sunlight legibility. Multi touch is present as well. Having such a capable display in a middle class device shows how far ahead of the competition Samsung is in the screen race. Right above the Exhibit’s screen, you will find the earpiece, ambient light sensor, proximity sensor, as well as the front facing camera unit. The left side of the device is where the volume rocker and microSD card slot reside. The memory card is easy to access and hot swappable. On the right side you will find only the power/lock key of the droid. The 3.5 mm audio jack and the microUSB port are placed on top of the Exhibit 4G. The bottom has a faux leather pattern and houses the mouthpiece of the device. 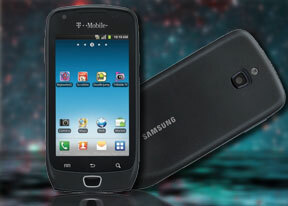 On the back of the phone, you will find the 3.2MP camera with its LED flash, and the loudspeaker grill. There is a 1500mAh battery under the cover and the SIM card slot. The latter gets inserted into the device much like the hot swappable microSD card. As far as battery use is concerned, the phone easily makes it through a full day of heavy usage including two email accounts in full sync, web browsing, about an hour of phone calls and quite a lot of video game time. Overall, the Samsung Exhibit 4G is easy to handle. The 3.5” screen appears to be a good blend of portability and usability. You can operate the device with one hand without worrying it will slip out of your grip. However, we have to mention that the plastic used for the body is not looking of particularly high quality and we found it to be rather prone to scratches. In fact, our Exhibit 4G got several noticeable marks in just a few days use without being abused in any way.